Q: We've seen you in so many programs over the past 12 months. How did you get involved in acting? Q: Where did you grow up in? A: Just outside Middlesbrough in a place called Grangetown. It's basically a big council estate. Q: I'd imagine it wasn't like it is now in Manchester where's there a such an industry swell in TV production. How was it from coming out of North in those days, as opposed to coming from London? A: Manchester's great now. There's so much great stuff going on from Granada, Red and World. I've had a great time filming up there because i've filmed so much great stuff. The Second Coming, Clocking Off, Booze Cruise, Early Doors. I really enjoyed it up there and London tends to be a bit more tricky. It's so busy so you end up doing a lot of Sundays etc. Q: What was your major first acting role? A: I suppose it would either be Career Girls, a Mike Leigh film, or a Eureka Street. Eureka Street was a thing set in Northern Ireland. It's just a fantastic script and directed by Adrian Shergold, who is basically a top director. It was about 2 irish guys, one of them who was me, and I guess that was my first big break. 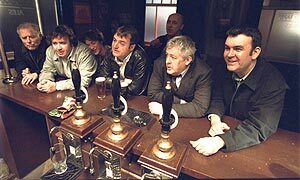 Q: The main reason we're calling you today is that Early Doors is in the Top 3 Best TV Programs of 2004. A: And so it should be. I love it. I think it's great. It's just one of those programs that when you're making it you have such a laugh. You know it's good stuff and even though you're having a laugh you get the work done...and as funny as it is on the screen it's even funnier in real life. Q: What's you best Early Doors moment? A: Any of the bits with Joan really. I love Eddie and Joan. What I love about it is you have this pub and Eddie and Joan are this daft pair that everyone loves and accepts them for what they are, whereas in a lot of walks of life you'd think they're just two nut cases. In the last series I loved all the pickles stuff. But I really liked where they had the whip round to pay the phone bill for them. I love hte bit where he gives him the envelope and it's quite sad really and the next episode you find out they've got another bill because he's spend all the money ringing round people to thank them. Q: Eddie and Joan are such strong characters. Are there plans to have a spin-off show? A: I guess they could. We're always joking with Craig and Phil about the house being called Bell End and obviously them not knowing what it meant. A spin off is something i've never really thought about, but I suppose they could and that would be up to Craig and Phil. It would make a nice one - At Home With The Bells. We have this image of them living in a dreadful house where the back door doesn't open cos the back garden's so messy. Q: Why do you think Early Doors has been such a success story. A: The thing I remember when I first read the scripts for Early Doors is it's not necessarily immediate. I think for people that have now become fans of the show, it's when you get to know the characters you love the characters and wait for them to do their thing. You wait for the coppers to arrive, you wait for Eddie to start boring people and Tommy to whinge. It's such a warm show. Q: Is there going to a 3rd series? A: I don't know. It would be nice if a few more people could see it and it went on BBC1. A certain amount of people haven't even seen it and didn't know it was on because it was hardly trailed. It just shows how good it is that it still got such a good audience and it was such a success even with the very little trailing they did for it. Q: What do you prefer - the straight acting roles such as The Second Coming or comedy such as Early Doors? A: I love em both. I'm really lucky because i've been able to do both and i've had to work hard to do that. They've both got their own rewards really. A lot of the time i've been in the right place right time. I think Red Productions (QAF, Clocking Off) are top of the tree really and everything they do is fresh and new. Q: What are you working on at the moment - it's Inspector Linley and Doctor Who isn't it? A: I've done an episode of Doctor Who where I play this Doctor Who boffin who's got this website running about the show and Billie Piper comes to find out about it. I guess I play the voice of every Doctor Who fan, (laughs), I'm not saying that every Doctor Who fan lives in a shed though. I talk about the Doctor in the way I suppose fans would...and then I get killed. Q: And the rest of 2005? A: I'm in a thing called Plane Spotting, which comes on in February. You know the guys that got arrested in Greece, it's about them and it's got myself and Lesley Sharpe in. I'm doing a couple more Booze Cruises and the show Christmas Lights has been extended into a series. Q: And am I right in thinking Early Doors could be coming back in another guise? A: I'd love to do a tour of Early Doors. It's something people have mentioned and the people that would come to see the show would be waiting for the characters to do their moments - Eddie talking about Jury Service and Traffic Lights and Pickles. It's in the everyone's mind at the moment and all the cast are up for it, but it's just a case of the logistics of getting everyone together. It's become more of a nightmare now Susan Cookson (Tanya) is in Casualty and it gets more difficult as it goes on. But we keep in touch with everyone and it's one of those jobs where everyone's really close. We had as good a laugh off camera as we did on.